Update to Hello Pal v2.0! Check out our new PLAY feature! Hello Pal also got itself a brand new look! And don’t forget… Hello Pal is now on the iPhone! With this new app release, we’re letting you play with your pals! 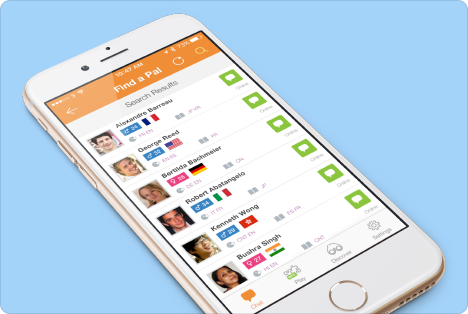 Challenge everyone in your contact list – find out who among you have learned the most in your chosen language! Think you’ve mastered the basics of Chinese? Memorized the phrases you need the most in Spanish? How about the main greetings used in Japanese? Put your language skills to the test by playing with your pals today! Our PLAY feature is completely brand-spanking-new (we’re still in BETA), so in case you find any bugs, please help us squash them by letting us know at our support website! We decided to give you a brand new look to match our brand new features! Hello Pal is looking sharp as ever: we’ve taken some tips from you and made the app more intuitive and sleek. We also implemented some changes on the Chat and Phrasebooks layout to help make finding phrases you need easier and more convenient. We know it was a long wait for many of you, but better late than never! Our Android version debuted in May earlier this year, and we already have a very large and active pool of users from virtually everywhere in the world. See you in Hello Pal – Happy chatting!